Salmon Statistics Northern Ireland DCAL Area: Interesting survival figures for 2013. Salmon Watch Ireland is interested in keeping anglers and conservationists up to date with recent statistical Atlantic salmon returns in the DCAL area. Any comments on same are most welcome. 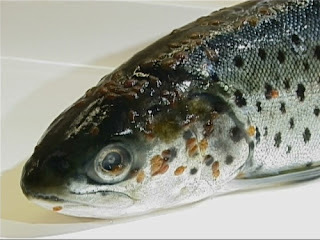 Salmon farms can have a significant impact on wild salmon and sea trout stocks A definitive scientific paper, reviewing over 300 scientific publications, has just been published in the prestigious journal Aquaculture Environment Interactions on the effects of sea lice on sea trout stocks. A team of top international scientists from Norway, Scotland and Ireland reviewed all available published studies on the effects of sea lice and have concluded that sea lice have negatively impacted wild sea trout stocks in salmon farming areas in Ireland, Scotland and Norway. Petition needs your support to help the River Lee recover. This endeavour will support more bio-diversity and help the threatened Atlantic salmon stocks on the River Lee. Salmon Watch Ireland welcomes discussion on this excellent report by ECOFACT. Are Ireland's large hydroelectric schemes sustainable? Attached is the IFI submission to DAFM in respect of the draft National Strategic Plan for Sustainable Aquaculture Development (on which SWIRL also made a submission). It is a robust and comprehensive treatment of most of the issues to do with salmon farming from a wild salmon/sea trout perspective.